Sajin Vass Gunawardena was many things to President Mahinda Rajapaksa. As occasion required, confidant, point man, trouble-shooter, go-between, trusted family aid and general factotum. When the Sri Lankan Government was conducting sensitive negotiations with the LTTE in Europe, it was Gunawardena who was the President’s eyes and ears, not his official delegation comprising several distinguished personalities. The President’s character – common, parochial – shaped the style of his Government, gossip and tale carrying valued while distrustful of the independent and objective approach of the professionals. There are many budget airlines operating in the world. Since so many countries are running budget airlines, it cannot be too difficult. Why don’t we try our hand at it? Perhaps, a case can be made that a budget airline would be a boon for our immigrant workers in the Middle East, an argument that ought to go down well with the voters. Since no local company will venture into unknown territory; even if they ever had entertained the idea, the bitter experience of SriLankan Airlines would have dispelled any illusion of going into such a grandiose project, especially, if it meant a partnership with the Government. It has to therefore be the Government alone that must take on the job. And, who will question the wisdom of a war-winning President when he recommends a budget airline for the struggling country? Only there is the small matter of setting up the airline and running it profitably thereafter. Unlike with other airlines such as Singapore, United and Cathay, which needed multi-disciplinary teams of top grade professionals and experts to do feasibility, planning and then setting up, we will simplify the process. Fortuitously, in the charmed circle of Presidential favourites, is the right man for the job, with a long entrepreneurial record and judged by the President as possessing strict rectitude, so essential when dealing with public money. Again, the judgment of a victorious President is not to be challenged. In another culture, the Mihin Air saga (named after the then President, who else?) would have been condemned as frivolous dilettantism. But here in this country, it is possible to invest billions of rupees of public money, on a venture, which crash-landed only in a few years; without any accountability. The then President saw much more than a pioneering entrepreneur and snitch in Gunawardena. Rajapaksa, who boasts many decades of experience in men and matters, thought Sajin Vass would make an ideal people’s representative, conceivably in his own rough and tumble image. Unmistakable Presidential patronage created a new career path for this man of unbound talent, bringing him into the Southern Provincial Council and then subsequently to the National Parliament. Not stopping there, President Rajapaksa even judged Sajin Vass Gunawardena to be ministerial quality, creating a new post for the young man – Monitoring Minister for External Affairs, the twin of the eminent Duminda Silva, the Monitoring Minister for Defence, under the Rajapaksa presidency. Now we discover to our amazement that this very public man, had not even filed the mandatory declaration under the Assets and Liabilities Law; in other words, a clear case of a law maker not following the law! Such integrity laws are now a standard feature of the legal framework of most countries. Generally, a holder of public office, spouse and children, are obliged by law to declare their assets and liabilities. This information is available for public scrutiny under the right to information. In certain countries there are permanent and independent bodies tasked with the function of monitoring the assets (and liabilities) of holders of high office on an on-going basis. The obvious reason for such heightened scrutiny is that good governance demands integrity of public office. For there to be good governance, those who govern must win the confidence of the governed, day after day. The importance of knowing the extent of the assets and liabilities of our parliamentarians, especially at the start of their career of so-called service, cannot be overemphasised. Unexplained enrichment or asset betterment can only point to corrupt practices or windfall luck from regular visits to Las Vegas; a prospect not too farfetched in Sri Lanka , as very many of our saviours have themselves found salvation in US citizenship. As a people, we seem to have misunderstood, or have no comprehension of honourable service; a public career considered like any other livelihood, a life-long opportunity to squeeze out anything and everything from it. There is hardly any politician in this country whose financial status has deteriorated on account of a public life. On the other hand, by becoming a Member of Parliament he acquires comforts and privileges which were way outside of his social strata; foreign travel, vehicles, perks, pensions, government jobs for all near and dear ones; now become standard features of his life. From the day of his election the masses behold a “Sir” and in his wife, a “Madam”. That even the honorific is in the English language form, and not in the much-acclaimed native tongue, is a pointer to the mindset of both the leader, and his following. It is not as if the man comes equipped to be a parliamentarian, leave alone a minister of the Government deciding on matters amounting to billions of rupees of people’s money. Many of our leaders have known no other employment than politics. Even if they had looked for productive employment at some stage of their lives, it is difficult to imagine a sensible employer wanting to employ persons of such doubtful nature. This obvious mismatch between the country’s desperate need for good Parliamentarians and the appalling lack of quality in those elected, leads to more money being spent on personal development and education; an amazing number of study courses, seminars and training at universities and other institutions, mainly foreign, are held for them. Later, they hold out a short stint at prestigious universities like Harvard or Cambridge as a qualification, implying they won it through the richness of their minds! Through endless social bloopers and gaffes the man polishes up his act, grooming himself and gaining social confidence with the years. This does not mean that at the end of the day we gain competent legislators. Nothing produced by the Government today; a piece of legislation, a gazette notification or even a simple Government printed application form can be considered effective or complete. These will be so full of errors, confusions and contradictions that most times the very opposite of the purpose is conveyed. Acts of Parliament need many subsequent amendments to make sense and then ends up so convoluted that it is of no practical use to anybody. A budget speech made with a lot of fanfare ( including a red bag, high tea – just like in England!) ends up with so many amendments and changes that sometimes only the opening line of the speech remains unsullied, the rest of the proposals given the short shrift in the confusing din. 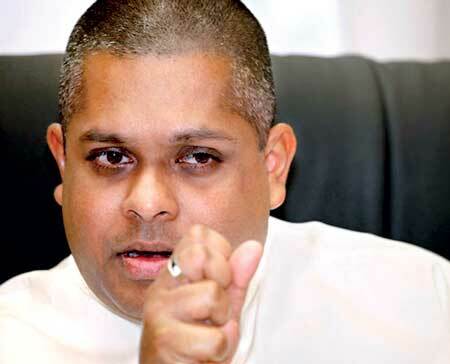 The Act of Parliament which insists on a declaration of assets and liabilities under which Sajin Vass Gunawardena was prosecuted appears no different. Having ignored the legal requirement while he was monitoring the work of the External Affairs Ministry, Gunawardena pleaded guilty to the offence of failure to file such a declaration. Based on his plea, the former Minister gets away with a measly fine of Rs. 1,000, the maximum possible fine under the Act! Since he is no longer a person to whom this Act applies, it is unclear as to whether he needs to ever file his assets and liabilities for the period when he held high office. Had the law truly appreciated the philosophy behind this Act, surely such a ridiculously low fine would have not been prescribed. In some countries, failure to file assets and liabilities will result in dismissal from office while in certain countries a person cannot hold office until this declaration is produced. Furthermore, it should be noted that children (of politicians) of over 18 years of age are not covered by the Act. This is perhaps the reason why many such youngsters (no longer in their teens) have developed a taste for short flights to international banking hubs like Singapore and Dubai! At least, the providing of their particulars (children over 18 – their names, addresses, if holding foreign citizenship, etc.) should have been made mandatory and these particulars referred to other authorities such as the Inland Revenue Department for further investigation. As it is, the current Act seems only a weak response to similar laws in other countries, a meaningless exercise purely to claim the respectability such laws give the status quo. The mere existence of an Assets and Liabilities Act will not stop corruption. If these are to have any meaning, the drive against corruption must come from the body and soul of the people. Where there is no seriousness, any law will remain a toothless tiger, only an ineffective ornament. Today, with a simple fine of Rs. 1,000, an offender can mock the law, making it only another gimmick played on a people bound and tricked all their lives.